SAS Analytics Accelerator 1.3 for Teradata. The third maintenance release for SAS 9.2 enables in-database processing for a set of core functions. This in-database processing reduces data movement between SAS and the database. It also enables you to take advantage of database processing power. SAS Enterprise Miner 6.2 includes in-database processing capabilities for sampling, variable selection, and logistic and linear regression modeling that are part of the SAS Analytics Accelerator for Teradata product. 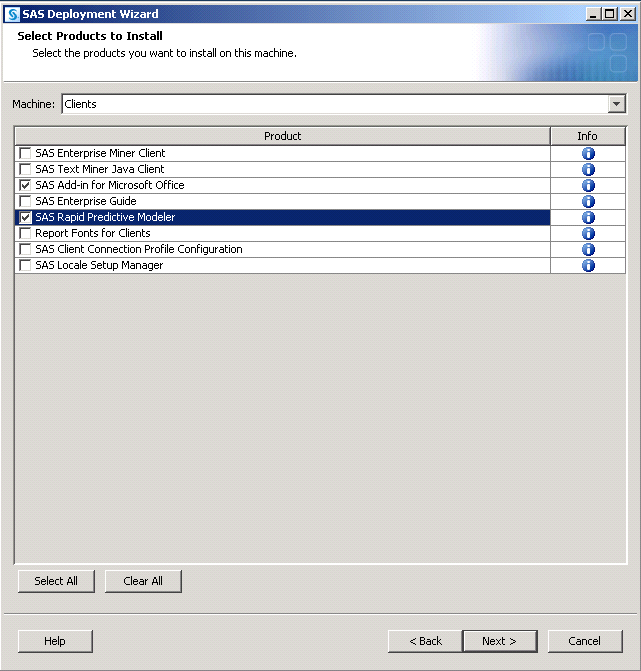 integration with the SAS Add-In for Microsoft Office 4.3. Your license for SAS Enterprise Miner includes a limited license for the SAS Add-In for Microsoft Office in Microsoft Excel. You must have Microsoft Office installed on your machine to install the SAS Add-In for Microsoft Office. the new SAS Rapid Predictive Modeler task that enables you to run prebuilt SAS Enterprise Miner models in SAS Enterprise Guide 4.3 and the SAS Add-In 4.3 for Microsoft Office. For more information, see SAS Rapid Predictive Modeler. updates to the Interactive Grouping and Scorecard nodes for SAS Credit Scoring. updates to the Input Data, Transform Variables, Reporter, Filter, and Score nodes in SAS Enterprise Miner. For more information about the new features and enhancements, see the “What's New in SAS Enterprise Miner 6.2” topic at http://support.sas.com/documentation/onlinedoc/miner. SAS Rapid Predictive Modeler is a new feature for users who need to rapidly predict models for common business problems such as promotion response and customer churn. These models can be integrated into standard reporting and production scoring processes on many platforms and databases. The modeling techniques have been designed to produce robust and accurate models in a large number of scenarios. SAS Rapid Predictive Modeler is highly automated. You must choose one dependent target variable, but all other selections are automated. All data transformations and modeling techniques have been parameterized. Output and reports have been predefined. The model can be registered in the SAS Metadata Server for integration by other products such as SAS Model Manager, SAS Data Integration Studio, SAS Enterprise Guide, the SAS Add-In for Microsoft Office, SAS Enterprise Miner, and many other SAS products. SAS Rapid Predictive Modeler appears as a custom task in SAS Enterprise Guide 4.3 or in Microsoft Excel by using the SAS Add-In 4.3 for Microsoft Office. You can find complete usage documentation in those products. Note: Your license for SAS Enterprise Miner includes SAS Rapid Predictive Modeler and a limited license for the SAS Add-In for Microsoft Office in Microsoft Excel. Models that you create using SAS Rapid Predictive Modeler can also be opened, modified, and run in SAS Enterprise Miner 6.2. To upgrade an existing SAS Enterprise Miner 6.1 installation to SAS Enterprise Miner 6.2, you must have administrator privileges for your operating environment and for installing SAS. To install SAS Enterprise Miner 6.2, run the SAS Deployment Wizard. This wizard automatically detects if there are SAS software products in your order that are more recent than the products you have deployed on your machine. For example, if your order includes a new release of SAS Model Manager and SAS Enterprise Miner, then both products are upgraded when you run the SAS Deployment Wizard. 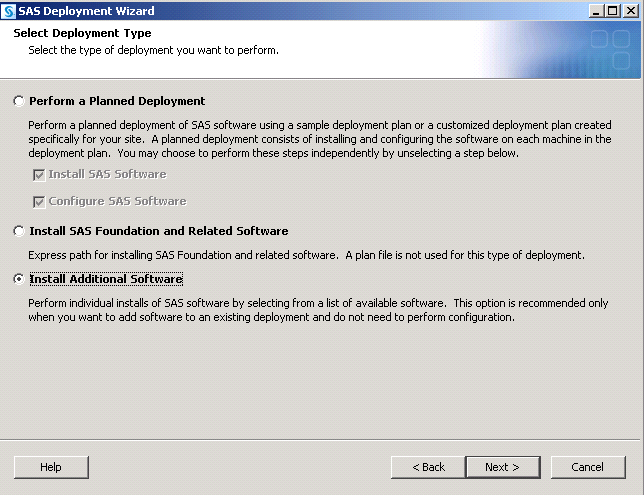 You do not need to run the SAS Deployment Wizard for each product. SAS Enterprise Miner 6.2 includes a new feature called SAS Rapid Predictive Modeler, which must be run from either SAS Enterprise Guide or the SAS Add-In for Microsoft Office. Therefore, your order also includes the SAS Add-In for Microsoft Office. Neither SAS Rapid Predictive Modeler or the SAS Add-In for Microsoft Office are automatically installed with SAS Enterprise Miner 6.2. After upgrading to SAS Enterprise Miner 6.2, you must rerun the SAS Deployment Wizard to install SAS Rapid Predictive Modeler and the SAS Add-In for Microsoft Office. 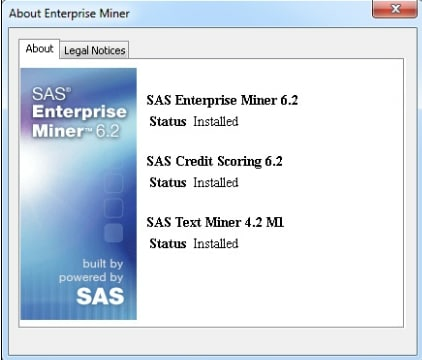 Note: If your site also licenses SAS Text Miner, the first maintenance release for SAS Text Miner 4.2 is automatically applied when you upgrade to SAS Enterprise Miner 6.2. After these software updates are applied, you must reconfigure SAS Text Miner on the client machines. The instructions for reconfiguring SAS Text Miner are included in the upgrade and configuration instructions for SAS Enterprise Miner 6.2. To upgrade to SAS Enterprise Miner 6.2, see Upgrading SAS Products. On all client machines, reconfigure the SAS Enterprise Miner Thin Client (and the SAS Text Miner Java Client, if licensed at your site) and install SAS Rapid Predictive Modeler and the SAS Add-In for Microsoft Office. For each client machine in your deployment, start the SAS Deployment Wizard by double-clicking setup.exe in the highest level of your SAS Software Depot. In the Select Deployment Type step, select Perform a Planned Deployment. 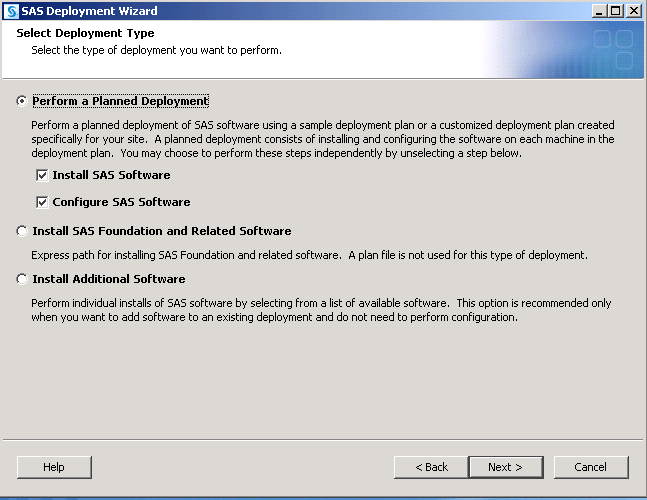 Then select the Install SAS Software and the Configure SAS Software check boxes. Click Next. In the Specify Deployment Plan step, select the new plan for your deployment. You cannot use your original plan file because that plan does not include SAS Rapid Predictive Modeler and the SAS Add-In for Microsoft Office. If you used a custom plan to originally install SAS Enterprise Miner, then you need to update this plan to include the new products, or you can select a sample plan (such as Enterprise Miner, two machines) to reconfigure and add these new components. Note: If your deployment includes SAS Text Miner, specify a plan file that includes both SAS Enterprise Miner and SAS Text Miner. A sample plan file is Enterprise Miner and Text Miner, two machines. After you have selected your new plan, click Next. In the Select Products to Install step, select Clients from the Machine drop-down list. Then select only the check boxes for the SAS Add-In for Microsoft Office and SAS Rapid Predictive Modeler. Note: You must have Microsoft Office installed in order to install the SAS Add-In for Microsoft Office. If you do not have Microsoft Office installed, then do not select the check box for the SAS Add-In for Microsoft Office. Depending on what SAS products you license, you are prompted to select the Microsoft Office applications where you want to run the SAS Add-In for Microsoft Office. In order to use SAS Rapid Predictive Modeler, you must at least select the check box for Microsoft Excel. If your site uses the SAS Add-In for Microsoft Office in other Microsoft applications, select those check boxes as well. In the Specify Configuration Information step, verify that the path to the configuration directory is the path that was created during the initial installation. When a message appears that the configuration directory and level contain existing files, click Yes to proceed. In the Select Products to Configure step, select SAS Enterprise Miner Thin Client Configuration (and SAS Text Miner Java Client, if SAS Text Miner is licensed at your site), and then click Next. In the Deployment Summary step, review the products that will be installed and configured, and then click Start. After the deployment completes, you should be able to run SAS Enterprise Miner 6.2 on your client machines. Follow these steps to install and configure SAS Enterprise Miner 6.2 in a single machine deployment. Examples of this type of deployment include the SAS Enterprise Miner Personal Workstation, the SAS Enterprise Miner Desktop, and DataMining for the Classroom. 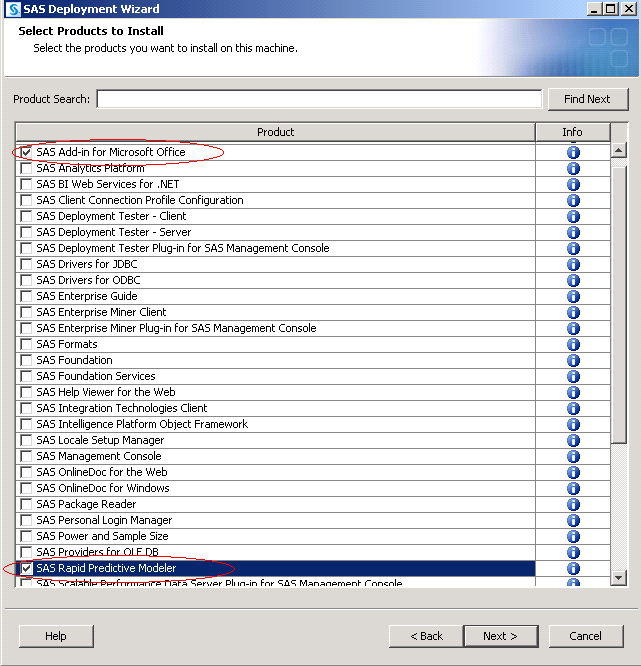 Install SAS Rapid Predictive Modeler and the SAS Add-In for Microsoft Office. Start the SAS Deployment Wizard by double-clicking setup.exe in the highest level of your SAS Software Depot. In the Select Deployment Type step, select Install Additional Software, and then click Next. In the Select Products to Install step, select the check boxes for the SAS Add-In for Microsoft Office and SAS Rapid Predictive Modeler. In the Deployment Summary step, review the products that will be installed, and then click Start. After the deployment completes, you must restart your SAS servers. You must restart these servers in the correct order. For more information, see “Overview of Server Operation” in the SAS Intelligence Platform: System Administration Guide. 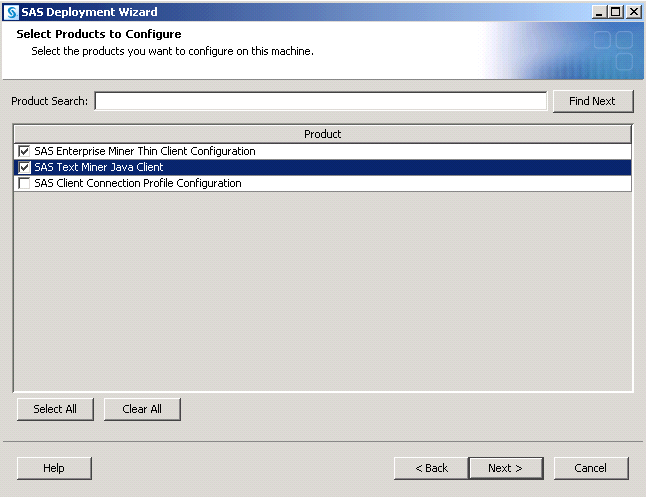 Now that the servers are restarted, you can run SAS Enterprise Miner 6.2 on your client machine. Note: If your site also licenses SAS Text Miner, then you also need to reconfigure SAS Text Miner. For more information, see How to Reconfigure SAS Text Miner. Note: The products that are listed in the About Enterprise Miner dialog box depend on what you have licensed at your site.